A black diamond engagement ring is an exciting twist on the classic white or colorless diamond. There are many gorgeous styles available to choose from, like this Embrace solitaire from Gemvara. It features a 0.54-carat, round-cut black diamond that's gracefully set in a wrap-style palladium band. This ring retails for about $960. 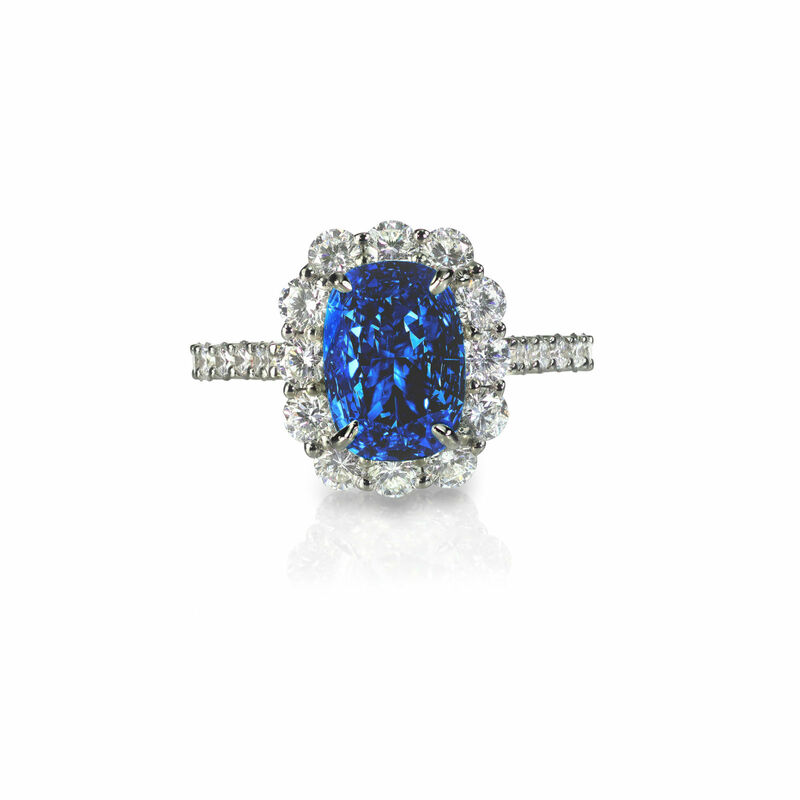 Click "Buy Now" for purchasing information about any ring. The stunning contrast of a white and black diamond engagement ring will turn heads anywhere you go. In this classic three-stone style, a round-cut white diamond is flanked by two smaller black diamonds for a total weight of 1.0 carats. The setting is luminous 14k white gold. This pretty ring retails for under $600. Although black diamonds are a modern choice for an engagement ring, they look absolutely stunning in an antique-style setting. In this beautiful ring, a 14k white gold filigree setting supports a large, round-cut black diamond, and smaller round-cut white diamonds trail down the shank. It has a total weight of 1.7 carats and retails for about $1250. The contrast of black diamonds and yellow gold makes a very striking engagement ring. In this simple design, a one-carat, round black diamond is prong-set atop a sweeping, 10k yellow gold setting. This stunning and simple solitaire retails for about $300. Black and white diamonds set in a modern ring make for a spectacular contemporary style. This Postmodern Princess ring from Gemvara is an excellent choice for the modern bride-to-be. It features a 0.69-carat, princess-cut black diamond in an angular palladium setting accented with 18 tiny white diamonds. This beautiful ring retails for about $2,400. For the ultimate in dark beauty, choose a black diamond ring set in black gold. Black gold is made by electroplating white gold with black rhodium, so it makes a spectacular setting for a black diamond ring. In this design, a 1.76-carat, princess-cut black diamond is surrounded by 1.15 carats of smaller white diamonds. The 18k black gold split shank setting gives this ring dark romance. It retails for about $2,100. A black diamond surrounded by white diamond accents can elevate your ring to a whole new level of elegance. This exquisite style is set in white diamond-studded swirls on either side of the 0.85-carat round-cut center black diamond. This beautiful ring retails for about $700. Flower motifs look stunning in high-contrast black and white diamonds. The spectacular Lotus Ring from Gemvara features a 1.49-carat, round black diamond surrounded by white diamond-studded petals, all set in 14k white gold. It's a gorgeous choice for a bride who loves nature and romance, and it retails for about $3,900. Twisted band engagement rings offer a graceful and delicate alternative to standard styles, and they are a lovely contrast with black diamonds. In this stunning design, the 14k white gold band is studded with dozens of white diamonds. The band supports a spectacular princess-cut black diamond for a total weight of 2.5 carats. This delicate design retails for about $1,700. No matter which black diamond engagement ring you choose, you'll love the way this surprising color choice brings a contemporary touch to classic styles. Try on several rings to find the one that's right for you.